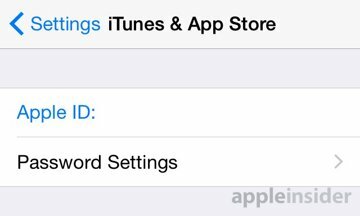 With the latest betas of iOS 8.3, users can open the Settings application and navigate to the "iTunes & App Store" options. There, a new menu called "Password Settings" can be seen underneath the Apple ID entry. From there, Apple has included a section called "Free Downloads," with the password requirement enabled by default. Though the setting is currently greyed out in iOS 8.3 beta 4, presumably it will become available when the software ships to users, allowing them to download free software without a password entry or Touch ID verification. 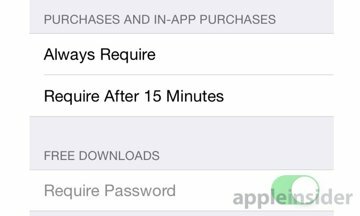 The Password Settings section also houses the controls for standard purchases and in-app purchases. Here users can choose to always require a password for purchases, or to allow a 15-minute window in which multiple items can be bought. New betas of iOS 8.3, both for developers and public testers, were issued on Tuesday. It's expected that iOS 8.3 will become available before the launch of the Apple Watch next month, on April 24.